Summary: This paper describes the potential effects of grouping arrangements (in particular ability grouping) for language education in classes for disadvantaged children in Hungarian primary schools. The findings of the present paper are based on a larger study which aimed at identifying the major problems faced by disadvantaged foreign-language learners and their teachers. The paper aims to construct a detailed and comprehensive picture of the process of language learning perceived by both the children and their teachers. The main research tool was in-depth interviewing, combined with classroom observations. The research used purposive sampling and focused on rural primary schools attended by a considerable number of disadvantaged children situated in Hungary. The findings indicate that ability grouping for language instruction is a prevalent form of arrangement; however, it seems to have long-lasting negative effects on the achievement of the children in lower ability levels. Резюме: Данная статья рассматривает возможные влияния групп (прежде всего, групп по способностям) на языковое воспитание детей с физическими или умственными недостатками в венгерских начальных школах. Результаты настоящей статьи основаны на обширном исследовательском проекте, целью которого является идентификация основных проблем изучающих иностранный язык и их учителей. В статье предпринимается попытка создать детальную и обширную картину процесса изучения языка с точки зрения детей и их учителей, включая учителей по основным предметам. Основными методами были подробные интервью в комбинации с наблюдениями в классной комнате. Исследование использовало целенаправленные эксперименты и концентрировалось на сельских венгерских начальных школах со значительным числом детей, с физическими или умственными недостатками. Результаты показывают, что группы по интересам распространенной формой в деле преподавания иностранного языка, но это имеет долгосрочные негативные последствия на успехи детей в нижней группе. Zusammenfassung: Dieser Artikel behandelt die potenziellen Auswirkungen von Gruppenarrangements (vor allem Fähigkeitsgruppen) für die Spracherziehung von benachteiligten Kindern in ungarischen Grundschulen. Die Resultate des vorliegenden Artikels beruhen auf einem unfangreicheren Forschungsprojekt mit dem Ziel, die Hauptprobleme von Fremdsprachen-Lernenden und deren Lehrer zu identifizieren. Der Artikel versucht, ein detailliertes und unfassendes Bild von dem Sprachenlernprozess zu zeichnen, aus der Perspekive der Kinder und auch ihrer Lehrer. Die hautsächliche Methode waren Tiefeninterviews in Kombination mit Beobachtungen im Klassenzimmer. Die Studie nutzte gezielte Stichproben und konzentrierte sich auf ländliche ungarische Grundschulen mit größerem Anteil benachteiligter Kinder. Die Resultate zeigen, dass Leistungsgruppen für den Sprachunterricht ein weitverbreitetes Arrangement sind, welches aber langfristig negative Auswirkungen auf die Erfolge von Kindern in der unteren Leistungsgruppe zu haben scheint. Hungary is one of the countries in which background characteristics are reported to influence student performance to a critical extent. Findings of the Programme for International Student Assessment (hereafter: PISA) indicate that family background plays a significant role in determining the achievement of children at school in Hungary (OECD, 2009). More than 20% of the differences in student performance are related to socioeconomic differences, which is more than in most OECD countries. The PISA studies draw attention to a serious performance gap between children with advantaged and disadvantaged socioeconomic background. Csapó, Molnár and Kinyó (2009) arrived at the same result when using data from other educational studies, adding that the present situation is the result of educational tendencies in the last few decades; furthermore, such tendencies seem to have become permanent in the last few years. These findings also suggest that Hungary may have an especially strong system of school selectivity. The role of foreign language learning is crucial for disadvantaged children as it may change the future life chances of people in the labour market and help them to break from the cycle of poverty. Successful language learning may lead to better opportunities in secondary and tertiary education. The increasing socioeconomic importance of the knowledge of the English language in Hungary is unambiguous. Public education is the main context where children start to learn a foreign language. The Hungarian National Core Curriculum (2007) requires that children must begin learning their first foreign language in grade 4 of primary school. However, the effectiveness of language teaching has often been criticized; the most common problems seem to be the lack of appropriately trained teachers, insufficient levels of intensity, outdated methodology and deficient technical aids (Petneki, 2002). More affluent families hire private teachers, pay for extracurricular language lessons at school, or send their children to language schools. Foreign language knowledge was found to be significantly influenced by family background, especially by parental educational attainment and status as children of more educated parents have much better foreign language knowledge (Andor, 1999). These trends of foreign language learning in present day Hungary may threaten the availability of equal opportunities in education. As a consequence, for children coming from economically disadvantaged families the only context of instruction, the primary school is essential as the school may well be their only chance to learn foreign languages. The main task for schools of disadvantaged children is to create the conditions for demanding and meaningful learning and intellectual achievement, including the opportunity to learn a foreign language effectively, regardless of minority group, geographic location, socioeconomic status or disability. 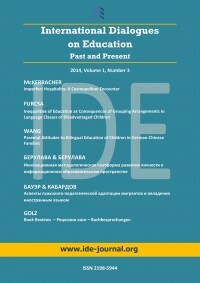 The aim of a larger research study conducted for my PhD dissertation (Furcsa, 2013) was to identify the major problems faced by disadvantaged foreign language learners and their teachers, and to build up a detailed and comprehensive picture, as it is perceived from the inside by both the children and their teachers in the Hungarian context. The research paid special attention to inequalities of education. Grouping arrangements of children during language education (especially ability grouping) seem to be related to important issues of inequalities which may result in serious underperformance in language classes. Language teachers are in charge of creating well-organized learning groups as group characteristics and group processes considerably contribute to any success or failure (Dörnyei and Malderez, 1997). A group can serve as an instrument of attitudinal change, the power of which should be exploited in groups with learners of special needs. Group characteristics such as structure of the group, norms and goals of the group or group cohesion influence the intensity and efficiency of language learning. Grouping arrangements refer to the ways in which children are organized for language instruction. It involves important considerations to provide a learning environment where interpersonal experiences support the learning process. It is generally recognized that whole class and large group instruction are inappropriate for effective language learning (McKay, 2006). Moreover, research on special educational needs indicates that small groups are more favourable for children with special needs (Kormos, Csizér and Sarkadi, 2009). In Hungary, Act LXXIX of 1993 on Public education prescribes the upper limit of classes and groups, however, it can be exceeded under specified statutory conditions. Small groups have several socio-psychological, pedagogical and management-related advantages in language instruction. Children have more opportunities to speak than they have in whole-class instruction, and communicative tasks are easier to set up (LoCastro, 2001). Small groups create opportunities for sustained dialogue and substantive language use (Hill and Flynn, 2006). There are more possibilities for positive interaction between the teacher and the learner (Englehart, 2009). Consequently, small groups are more feedback-rich and there or more opportunities for correction. Techniques of differentiation are more difficult to apply in large groups. In small groups, the teacher can get to know the characteristics of the children better and can meet their individual needs more easily. Additionally, a larger group size is more complicated to manage, as a result of which the teaching style is likely to become more authoritarian (Englehart, 2009). Pair and group work are more difficult to organize in large groups. Based on these arguments, educational organizers make serious efforts to make language instruction in small groups possible. The purpose of the present paper is to analyze how the head teachers, the language teachers and the children view the grouping arrangements applied in primary schools. The qualitative methodology applied in the present research arises from the aim to explore in depth the experience, views and perceptions of socially disadvantaged children and their teachers, and to collect data that is multi-layered, incorporating behaviour, opinion and emotion. The present research combined in-depth interviews with observation. The main source of empirical data for this study was provided by a large-scale interview study, which included interviews with the head teachers and language teachers of the schools, and focus group interviews with disadvantaged children. Direct observations were found to be necessary both to give an as complete a picture as possible and to provide additional information about what the teachers and children say in the interview. Interviewing helped to reveal the meaning that the teachers and children attach to their behaviour or to particular issues in language teaching. The structure of the interviews was semi- or partially-structured, where domains of inquiry were determined and actual questions were formulated, however, the interviewer had the possibility to change the sequences of questions or the questions themselves, or include extra questions during the interview process. As recommended for qualitative interviews, broad, open-ended questions were employed. In addition, general questions were used to investigate complex phenomena, prompts to clarify details and probes to ask respondents to elaborate on a topic. In order to ensure that the same essential information was obtained from every respondent, an interview schedule was created and validated for the three types of interview. Interview schedules were useful because they ensured good use of limited interview time, they made interviewing more structured and comprehensive, and they helped to keep interaction focused. The research tool selected for the interviews with the children was focus group interviews. As usual in focus group interviews, participants were asked to reflect on the questions asked by the interviewer, give their own comments, listen to what the rest of the group had to say and react to their observations. Focus groups largely depend on the interaction within the group. Using focus group interviews is a recommended research technique when dealing with children (Darlington and Scott, 2002). The group situation may be more familiar to them and less intimidating than the individual interview; and deeper and more detailed information may be gained when children encourage each other to communicate. The present research is a qualitative research project, which incorporates ethnographic elements. Ethnographic research can be characterized by long periods of involvement on the part of the researcher in order to get an in-depth understanding of the observed phenomena by watching behaviours, interactions and communications of participants (Patton, 2002). However, the main focuses of this study are the ideas and the interpretations of participants, therefore observation remained a subsidiary research tool applied for the purpose of triangulation. The research focused on rural primary schools in Hungary. The aim of sampling was to select villages the schools of which were attended by a considerable number of disadvantaged children. The most important sampling criteria were educational level and unemployment of the parents. Education level referred to completed years of primary education and unemployment was determined by the rate of registered unemployment (source of data: 2001 Census in Hungary)1. The participants for the interviews included the head teacher of the primary schools, the foreign language (English or German) teacher(s) of the schools, and groups of children (5-8 children from grades 4-8) in each focus group taught by the teachers interviewed. The total number of interviews involves seven interviews with teachers of English and eight interviews with teachers of German. Ten focus group interviews were conducted with children in groups of 3-6. The classroom observation concentrated on the classes taught or attended by the teachers and children who were interviewed. Qualitative data analysis means synthesizing the information obtained from the interviews and observations into a coherent description of meanings (Patton, 2002).The transcripts and field notes were coded through analytic induction and constant comparative methods detailed in Maykut and Morehouse (1994), which uses inductive logic to develop emerging themes and categories simultaneously from a mass of narrative data. The present paper concentrates on the category of groups including group formation and group environment. The quotes were selected to provide an understanding of the respondents’ perspectives and to illustrate the observed phenomena. The narratives were translated from Hungarian. In the schools of the sample for this research, head teachers attempted to follow the recommendations for small group sizes, therefore classes were split into halves for language instruction if school resources made it possible at all. Group sizes ranged from eight to twenty-three (in whole class instruction), in the majority of the observed classes groups were halved. Both head teachers (even if they are not specialized in language teaching) and foreign language teachers of the schools made it clear that that small groups are regarded as an indispensible prerequisite of effective language education. no specific placement criteria (1 school). These groups were reported to remain relatively stable for years. In the schools, the groups of lower ability children were named as normal, basic or regular groups, whereas the names of the higher ability children had extremely positive labels, such as honours, gifted or advanced group. Neutral terms were rarely used, in one classes the groups were called Group A and B. It indicates that in more homogeneous environment, low performing children lower aspirations and gradually become demotivated. Hall (1997) calls attention to further threats of ability grouping as in the group of low performing children, “there is less instructional time, less material covered, lower difficulty or material presented, lower teacher quality … There are also lower teacher expectations and encouragement, more teacher interruptions of student responses and different advice about educational and occupational options” (p. 21). Moreover, ability grouping might be used to segregate children as Farkas et al. (2007) gives account of cases when the placement of Roma children in remedial or catch-up classes was not justified by their low performance. The language classes of two special remedial groups were observed which consisted of extremely low-performing children with behaviour problems. In one group in School S1, the head teacher permitted classroom observation only in her presence. It prevented getting a real picture of the children as they behaviour seemingly changed when they realized that the head teacher would also participate in the language lesson. The language teacher mumbled under her nose after the class: “This was a group of hopeless children. I hated coming here and I only hoped for surviving every lesson” [S1TE1], which was not really supported by the classroom observation. The only significant difference was significantly slower pace and the lack of homework because “they never do homework at home, so I stopped giving it” [S1TE1]. The teacher felt in a desperate situation without any help from the school and she did not have either intentions or methodological means to improve the group. The second catch-up group in school S4 consisted of low-ability children with one dyslexic boy. The children were apparently bored and demotivated. The whole class concentrated on practicing grammar structure with drills, the exercises seemed to be well above the level of the group, after the class the teacher explained that “we have to follow the course book, we’ll have to finish it by the end of the school year” [S4TE2]. These findings indicate that teachers provided inferior instruction and had modest educational goals for lower achieving children. They appeared to have negative feelings and lower expectations for them. They also expressed their lowered expectations to the children, which might be especially harmful for their motivation. Teaching lower ability groups was found to be regarded as low-status activity or even ‘punishment’ in some schools. It is essential that teachers should be aware of the specific needs of each child. The initial job for the teacher is to investigate each child’s family circumstances and school history. In the focus group interview children also mentioned problems with children of other classes, however, they did not see it as important because they experienced it also in other classes or during the breaks. The hostile atmosphere of the language group may prevent cooperation and may influence learning effectiveness severely, which was confirmed by teachers who complained about serious discipline problems in the lower ability groups. The findings suggest that the acknowledged advantages of small groups in language pedagogy have lead to the revival of systematic ability grouping arrangements in primary schools in Hungary. The results indicate that their negative effects concern children in lower levels significantly. In particular, motivation and discipline problems seemed to prevail in these groups. As these groups were stabile for several years of primary school, the negative effects of grouping arrangements may have long lasting negative consequences for the language learning of children. The inefficiency of the so called ‘catch-up groups’ of lower ability children was confirmed. The findings of the present research can inform not only teachers involved in foreign language education, but also teachers of other subjects. Moreover, the results from the present investigation might provide useful information to those involved in educational policy making. Teachers’ awareness towards the negative effects of ability grouping should be raised, furthermore, successful techniques for differentiation and alternatives to ability grouping should be provided for teachers. Andor, M. (1999). A kétféle diploma. Iskolakultúra, 9(1), 46-54. Csapó, B., Molnár, Gy., & Kinyó, L. (2009). A magyar oktatási rendszer szelektivitása a nemzetközi összehasonlító vizsgálatok eredményeinek tükrében. Iskolakultúra, 19(3-4), 3-13. Darlington, Y., & Scott, D. (2002). Qualitative research in practice: stories from the field. Buckingham: Open University Press. Dörnyei, Z., & Malderez, A. (1997). Group dynamics and foreign language teaching. System 25(1), 65-81. Englehart, J. M. (2009). Teacher–student interaction. In L. J. Saha & A. G. Dworkin (Eds. ), The international handbook of research on teachers and teaching (pp. 711-722). Norwell, MA: Springer. Farkas, L., Németh, Sz., Papp, A., Boros, J., & Kardos, Zs.(2007). Hungary. In Equal access to quality educationfor Roma, Volume 1, Monitoring reports on Bulgaria, Hungary, Romania, Serbia. Open Society Institute, EU Monitoring and Advocacy Programme (pp. 181-324). Budapest: Open Society Institute. Furcsa, L. (2013). Teaching foreign languages to socially disadvantaged children. Unpublished doctoral dissertation, Eötvös Loránd University, Budapest. Hall, P. M. (1997). Race, ethnicity, and multiculturalism: Policy and practice. New York: Garland. Hill, J.D. & Flynn, K.M. (2006). Classroom instruction that works with English language learners. Alexandria, VA: Association for Curriculum Development. Kormos, J., Csizér, K., & Sarkadi, Á. (2009). The language learning experiences of students with dyslexia: Lessons from an interview study. Innovation in Language Learning and Teaching, 3(2), 115-130. LoCastro, V. (2001). Teaching English to large classes: Large classes and student learning. TESOL Quarterly, 35(3), 493-496. Maykut, P., & Morehouse, R. (1994). Beginning qualitative research. London: The Falmer Press. Organisation for Economic Co-operation and Development (2009). PISA 2006. Technical report. Paris: Organisation for Economic Co-operation and Development. Petneki, K. (2002). Az idegen nyelv tanításának helyzete és fejlesztési feladatai. Új Pedagógiai Szemle, 52(7-8),147-160.